Sports podiatry involves the treatment and rehabilitation of pain and injury from sports and physical activity affecting the lower limb and foot. We see the everyday runner, casual gym individual, professional athlete, as well as the everyday active individual who is trying to have a healthy, active lifestyle. Sports injuries can affect anyone of any age, and to a different degree, depending on the different injury. In addition, we provide footwear education, orthotics education, and create training programs for individuals who are just beginning to get into physical activity or who are recovering from injury. 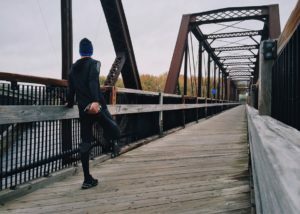 Being physically active is important for our health and wellbeing but, “according to surgeons at the American College of Foot and Ankle Surgeons, doing too much too soon can wreak havoc on the feet and can cause painful overuse injuries: tendonitis, ruptured tendons and stress fractures, to name a few”. If you are suffering from any foot or lower leg pain while being active or you are wishing to start getting active but you are worried about injury or not sure what type of shoes you should be wearing, don’t hesitate to visit us at Podiatry HQ and one of our friendly podiatrists will help you be pain free and able to stay active.